Now that I have caught you up on my past religious institution journey, let me explain how I got to this point from the beginning blog about priorities and time and anxiety. It’s a Sunday in January 2019 as I write this. I went to church on Wednesday night because churches have changed to accommodate the busy schedule we all have today. Our priorities have changed. Schools do not make time for religion. Sports and activities do not make time for Sunday and religion. And my Facebook people on Slices of Life, along with me, are filled with anxiety and fear and we can’t find five minutes to take a breath, pray or read a chapter in a book. And that in itself makes us anxious. All I have is my own journey to critique. I write books for a living and am semi-retired. I work from home and yet…I am stressed and anxious much more than I was in my younger years when I really had things to be stressed about. Still, I found time in those days to read a book and be involved in my religion. But I also know now at this stage in my life I am questioning more. I am frustrated frequently with the dynamics of society. Maybe it is because I am older and I have time to think about it. Why would my mother marry someone she thought was going to hell because he wasn’t Catholic? Did she become more rigid as she got older? Does it matter whether I am Catholic, Lutheran, Methodist etc. as long as I believe in God and worship Him in some way? What is more important in a church? Is it the appearance of a building or a person or the outreach and teaching of love for one another? I know I need a church family but I can no longer color inside the lines because I feel the joy being stifled. We live in a society now made up of all races and religions and we expect everyone to fit into one box rather than embracing what one can bring to the other. I think I have always felt that way but have conformed to societies expectations because I was taught that was what one did as a woman, as a wife, as a mother, as a church member, and as an American. I wanted to be liked and accepted. I wanted to be included so I fit in. But now I want to be me with my wild ideas, with my wild imagination and with my not caring about what is on the outside but what is on the inside. I feel alone some of the time when I am in a group that makes me feel as if a change is not progress, and wants to hold on to what was no matter if it turns people away or stifles growth. I feel like an outsider when others scoff at my ideas because my ideas don’t conform to what society expects. Part of my frustration probably is that I am a sum of all my parts. Each person has to find spiritually, that which draws them closer to what I call God or to their name for their higher power. It may be Catholic or Lutheran or Methodist or whatever religion speaks to their heart. But the sum of all my parts are a conglomeration of religions from my ancestors and I think I feel that because I want to raise my hands in praise and shout loudly with joy. I want to clap, yes clap my hands. That may be why committing to one denomination and their beliefs are so hard for me. I come from roots of many religious belief systems and I loved those people. How could those good, loving people be bad because they chose to worship a different way than me? All I knew from them was love. Taking five minutes with Max Lucado’s book or five minutes just to be in the moment has helped me accept me and know that my anxiety and fear might also come with trying to live in a world that is loud in judgment at those who are different, or when not agreeing with the norm or the popular opinion. All my life I may have blindly accepted or followed, without taking time to think it through or question why the spoons had to be so perfect in a church. Was I afraid if I revealed my true self I would be asked to leave? There is a lot of anxiety in wanting to be accepted, in wanting everything to be perfect and by disallowing how we truly feel and going along with what society deems is honest and truthful because let’s be honest and truthful –––honesty and truth in 2019 are not what they used to be. And it causes anxiety and fear. Perhaps in our busy lives, we can’t find five minutes to read, to breathe, to be kind to someone or to take time for ourselves because we don’t want to face what we want to change in ourselves. Those five minutes I take to read and refresh and pause, make me also realize I kept so busy because I didn’t want to take the time to face my life. I didn’t want to know me because maybe I didn’t like who I was, or maybe I was afraid to speak up because of the ridicule and repercussions. My friend was right. I needed the forced time to confront my journey. It wasn’t easy. Life is hard. But looking at life and where we have been and where we are going is almost harder. Right now my five minutes a day reading is a book called, Catching Your Breath, the Sacred Journey from Chaos to Calm by Steve Austin. I have only made it to Chapter Two but this book is what prompted these few blog posts. He brought up many of the feelings I have wanted to articulate but have been afraid to. I can’t wait to read the rest, five minutes at a time. My journey is a work in progress and it will be for the rest of my life. Thank you for reading and sticking with me during this diatribe. 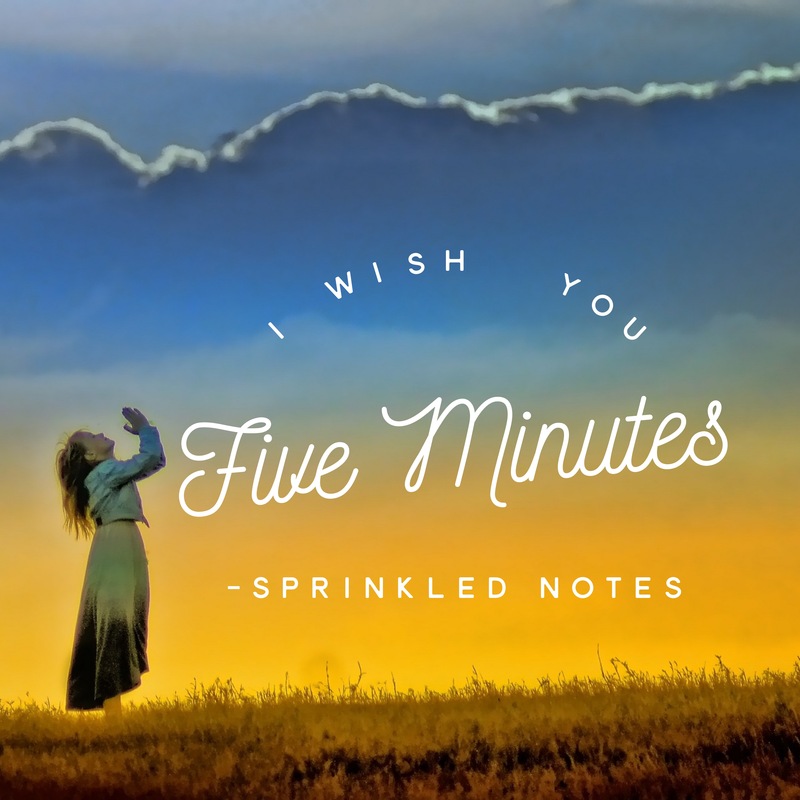 I wish you five minutes. Julie, I truly enjoyed following your blog this week. So interesting and thought-provoking. Thanks for sharing. Steve Austin is a glorious writer isn’t he? You are so progressing in your journey. We will do it together.